Thirty Apps are pre-loaded. Popular App titles include Cabri Jr., CBL/CBR, Conic Graphing, Inequality Graphing, Probability Simulations, Science Tools, StudyCards, TimeSpan, Topics in Algebra 1 Chapter 5, Topics in Algebra 1 Chapters 1-4, Transformation Graphing, and more. For students in math and sciences, the TI-84 Plus Silver Edition is a powerful, problem-solving tool with features for storing, graphing, and analyzing up to 10 functions. Plus, it displays graphs and evaluates tables on a split screen, allowing you to trace the graph and scroll through table values simultaneously. With the TI-84 Plus Silver Edition, you can view an equation, its graph, and the coordinates all at one time. Jump from point to point by entering a number. Several useful plot types are available, including scatter, box-and-whisker, XY-line, histogram, and normal probability plots. Advanced statistics and regression analysis, graphical analysis, and data analysis are readily accessed, along with features for calculus, engineering, financial, logarithm, trigonometry, and hyperbolic functions--all crucial tools for advanced analysis. With its clear display and fast processing, the calculator incorporates graphing tools for mathematics and science course work, including statistics and finance. The TI-84 Plus Silver Edition is powered by four AAA alkaline batteries (not included) , with an automatic shutoff to save energy. The Texas Instruments TI-84 Plus Silver Edition Graphing Calculator allows to view an equation, its graph, and the coordinates all at one time. Jump from point to point by entering a number. Several useful plot types are available, including scatter, box-and-whisker, XY-line, histogram, and normal probability plots. Advanced statistics and regression analysis, graphical analysis, and data analysis are readily accessed, along with features for calculus, engineering, financial, logarithm, trigonometry, and hyperbolic functions--all crucial tools for advanced analysis. With its clear display and fast processing, the calculator incorporates graphing tools for mathematics and science course work, including statistics and finance. Thirty Apps are pre-loaded. For students in math and sciences, the TI-84 Plus Silver Edition is a powerful, problem-solving tool with features for storing, graphing, and analyzing up to 10 functions. Plus, it displays graphs and evaluates tables on a split screen, allowing you to trace the graph and scroll through table values simultaneously. The optional kickstand slide case is great for desktop work. The TI-84 Plus Silver Edition is powered by four AAA alkaline batteries (not included) , with an automatic shutoff to save energy. 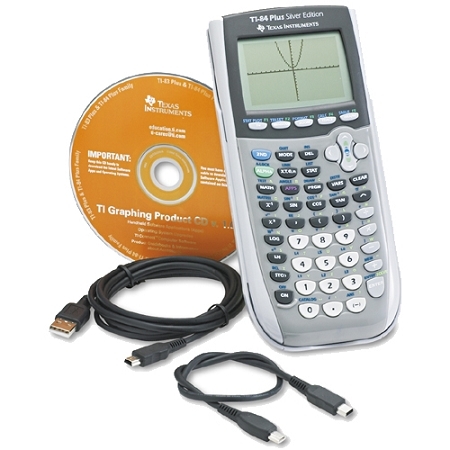 TI-84 Silver Plus Silver Edition, USB cable/TI connectivity cable, silver faceplate, manual on CD, four AAA batteries not included, alkaline recommended; color faceplates not included. I am so very pleased with math4sale! The calculators that I ordered work perfectly, and I cannot tell that they have been touched by human hands and were refurbished. Seriously, they look and function perfectly! A very nice man from math4sale called me within 4 hours of my online purchase to thank me and ask if he may be of further assistance...truth be told, I bit his head off a little bit, as I thought that it was yet another publisher salesman calling on my limited lunch break. I apologized profusely and he was a complete gent about it. I was given a budget of $1,000 in order to buy more calculators forr circulation in my library collection, and due to the GREAT prices I was able to order an extra calculator...talk about a sweet deal! The shipping was a meager $3.95!!!! Seriously, this is a great bang for the buck, and the customer service is superb. Will be ordering again, and telling all of my education friends about this great site with such great products and service. Thanks math4sale! product same as advertised. my daughter love using it. delivered on time. really smooth transaction. Smooth, easy transaction. I highly recommend this seller. A pleasure to do business with! I ordered Sunday night and they shipped first thing Monday morning. Can't ask for more.